Gold and gold stocks have be stabilizing for months and have been quietly rising. Many gold stocks are up 30% even 50% in the past three months. The $HUI AMEX Gold Bugs Index is up over 30% from the lows. If you think you have missed most of the move already you are wrong. The truth is most of the biggest rallies in stocks take place after a basing pattern with 30 -50% or more has formed. 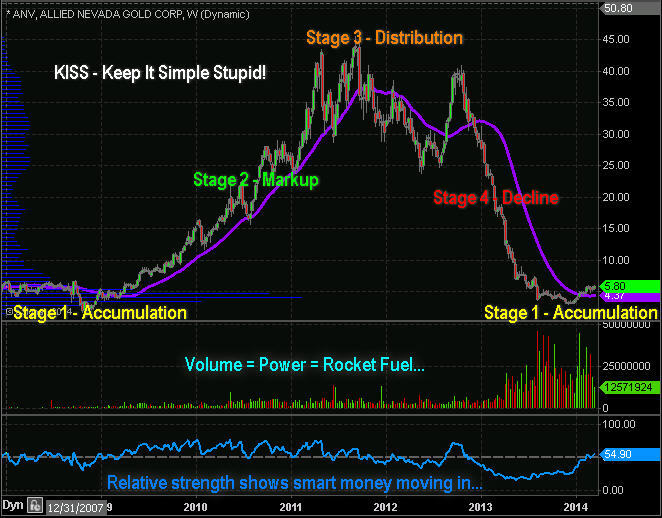 This is signaling massive accumulation in gold stocks and its happening right now by the institutions. So in this exclusive report I want to share one golden rocket stock pick which I feel has huge upside potential “IF” the precious metals market and miners can breakout of this stage 1 pattern it has formed. One thing that excites me is about precious metals and gold stocks is the fact that we have heard nothing about gold, silver or mining stocks in the media for months… almost like the big institutions have told the media to avoid putting the spot light on it until they accumulate all they can in terms of physical bullion and stock shares. This is the same for a few other sectors I have been watching build massive stage 1 bases in over the past few months and will be investing and actively trading them also once they break out of the basing stage. 3. Know why and how stages must be traded for timing your entry, profit taking and exits. 4. Scan the market for the top performing sectors and focus on stocks/ETFs within those sectors. 6. Sit back, watch and monitor position for possible change in the stage, to adjust stops and identify profit taking levels. The chart below is top quality gold stock which has all the characteristics of a big winner. Just to be clear, I normally do not mention individual stocks within public reports. I am not compensated in any way to post this report. This is nothing more than my technical outlook on a stock and not investment advice. I do plan on buying some shares of this company this week or next. While it still my be a little early for precious metals to bottom, it looks as though the stage (pardon the pun) has been set for a precious metals bull market to start. As they say, there is always a bull market somewhere… the key is finding it and taking the proper action. If you want simple, hassle free trading and investing join my newsletter today.